Most protein bars or nutrition bars on the market these days contain a high amount of sugar. Oftentimes, this concentrated amount of sugar hits your system directly. This results in a blood sugar spike. Most people are fine with, or even welcome, this increase. Especially since sugar levels in our blood is the body’s main energy source. However, others are much more sensitive to this quick imbalance, such as those with diabetes. Are you looking for a nutrition protein bar that will resulted in a more muted response to your blood sugar levels? 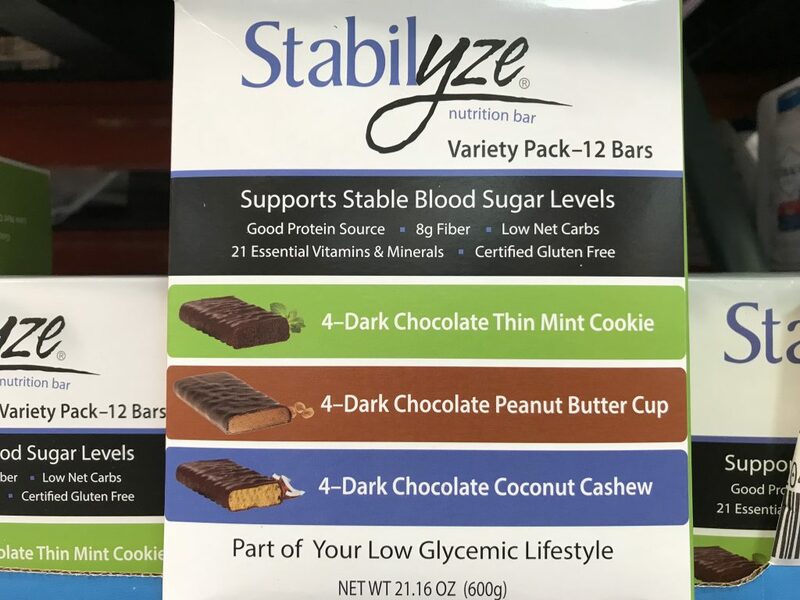 Then Stabilyze Low Glycemic Nutrition Bar may be a good product for you. 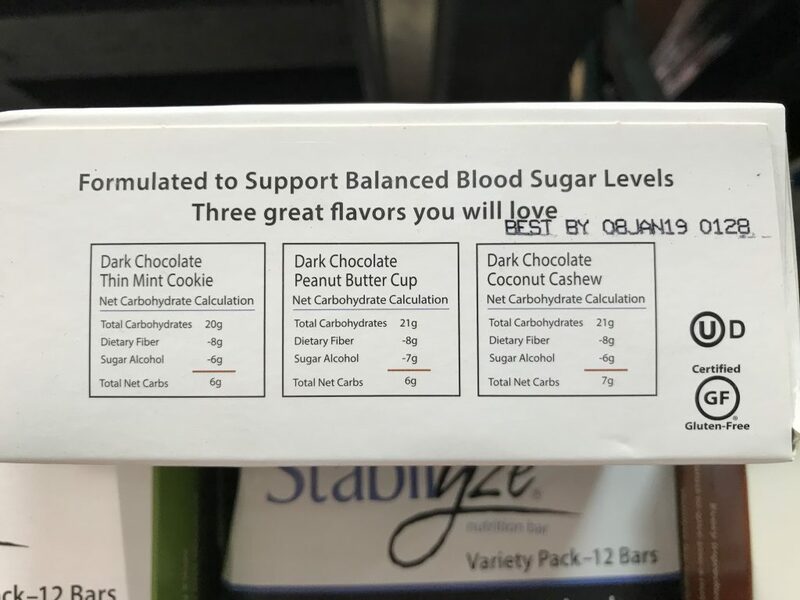 Item name: Stabilyze Low Glycemic Nutrition Bar. 8 grams of fiber per bar. 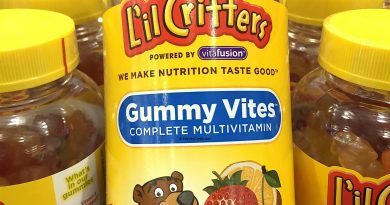 Contains 21 essential vitamins and minerals. A good part of a low glycemic lifestyle. Variety pack with three different flavors. 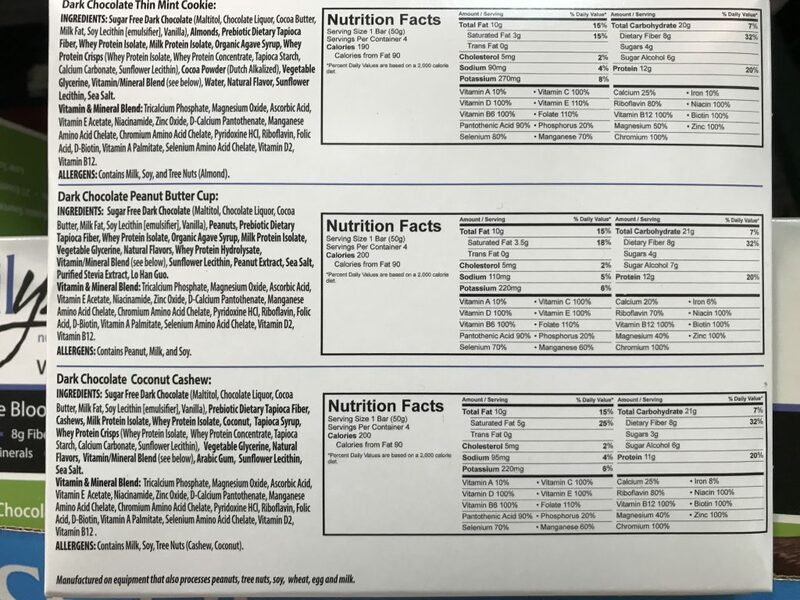 You can see the full ingredients list in the product panel image below. 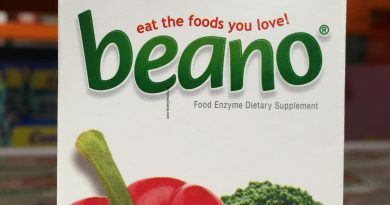 Allergen information: Contains milk, soy, and tree nuts (almond, peanut, cashew, and/or coconut). Serving size is one nutrition bar (about 50 grams). Each bar contains about 15% total fat, 6% daily value of potassium, and 12 grams of protein. The Stabilyze bar is also a great source of fiber and a variety of vitamins. There is a proprietary vitamin and mineral blend in each of the bars that functions almost like a daily multivitamin. So consuming this protein bar will get you quite a bump in the nutrition you need every day. Unfortunately for those of you who are dairy free or lactose intolerant, you may want to consider other products. 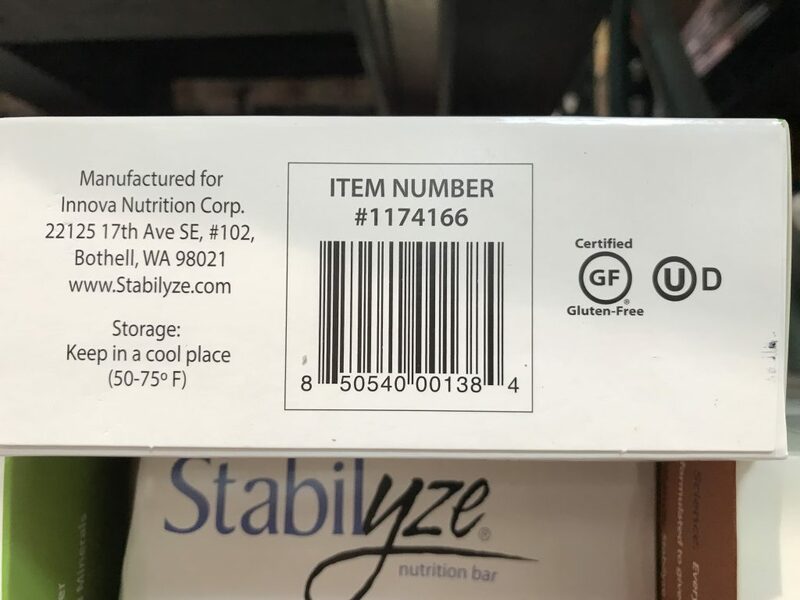 Innova Nutrition Corp, a company based in Bothell, Washington, manufactuers the Stabilyze nutrition bars. This protein bars can be a friendly part of your low glycemic diet. The manufacturer balances the total carbohydrates with the amount of dietary fiber and sugar alcohol in the ingredients. This formulation supports a more sustainable and balanced blood sugar level. The resulting total net carbs is low at about 6 grams per serving. How to Achieve Balanced Blood Sugar Levels? My grandpa has been struggling with Type 2 diabetes for almost a decade now. At least a couple times a day, I would see him pay a visit his secret chocolate stash to “get his blood sugar back up,” as he says. It’s hard for a healthy person to fathom the symptoms of low blood glucose but it’s not a fun experience, that’s for sure. Diabetic medications increase the level of insulin in the body. Although this helps control blood sugar levels, sometimes it over compensates and causes hypoglycemia. This is when the person feels lightheaded and shaky as their body’s blood sugar level is low. Without enough energy source, the body will feel tired, fatigued, and certain functions start shutting down. Unless that sugar level is rebalanced in time. As a result, I am always seeing him reach for a piece of chocolate or open up a can of soda. This constant tug of war between high insulin levels and the consequential low blood glucose puts a toll on him and those around him as well. Where is a Low Glycemic Diet? If you have diabetes or pre-diabetes, chances are your doctor has advised you about diet and its impact to your health. Especially to your blood sugar levels as it fluctuates by the hour based on your food intake. A low glycemic diet simply ensures that the food you consume does not cause a spike in your blood sugar level. For example, if you consume white rice or plain white bread, it gets turned into sugar immediately as it hits your digestive system. As a result, this causes your blood sugar level to increase quite quickly. This is similar to drinking sugar water. A low glycemic diet will help you control blood sugar spikes and avoid high insulin levels. This diet tries to avoid sugared drinks and candy, at its extreme end, and focuses on vegetables and whole grains, at its lowest spectrum. By doing so, you avoid drastic changes in your blood sugar level. Diet control is one of the most effective ways to manage the symptoms of diabetes and other related diseases. 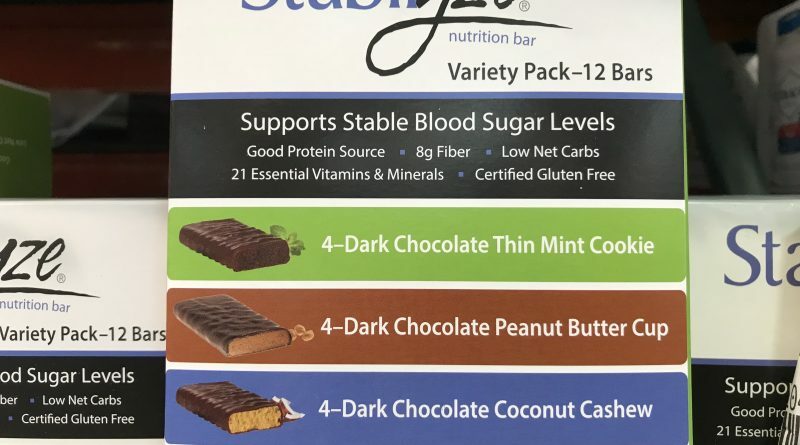 Looking to Purchase Stabilyze Low Glycemic Nutrition Bar? 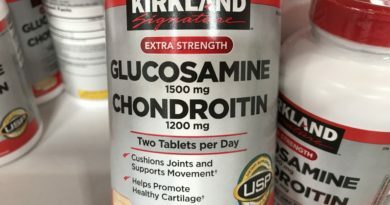 I have seen this product tucked away in the supplements/medical section of various Costco warehouses. It should be by where they have protein bars and dietary supplements. For your convenience, Amazon has this item in stock at the best price with shipping included. Do you struggle from high blood sugar or diabetes? What are some dietary controls you live with? Share your thoughts and experiences below.